At Almaden County Club Dental, in the Almaden neighborhood of San Jose, we’re all about ensuring your dental health and happiness for the rest of your life. Taking into consideration your long-term dental goals, Dr. Vidya Bobba and her friendly team create a treatment plan that is just right for you and your needs. Having ideal oral health is something we believe everyone deserves. Let Almaden Country Club Dental be your dental home. We occupy a spacious and modern yet homely dental office in the beautiful Almaden Valley neighborhood of San Jose. The office is located in a single storied medical and dental office building. There is ample parking space with provision for handicap parking. 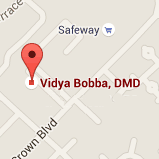 Dr. Bobba has been an Almaden Valley Dentist since 2004, after she took over this well-established 30+ year old practice. The office was completely remodeled, with all new equipment, in the summer of 2011. We take pride in calling ourselves a family dental practice providing all services associated with general and cosmetic dentistry. We love working with people of all age groups. We practice comprehensive dental care with a conservative approach. Whether you are in need of a simple cleaning and exam, or you’re interested in our wide range of cosmetic and restorative treatments, you can count on receiving state-of-the-art care at our San Jose dental practice. We are proud to offer clear braces, teeth whitening, porcelain veneers, digital x-rays, caries detection laser and soft tissue laser in addition to our comprehensive general dental services. When you’re ready to take the next step toward a life of dental health, please feel free to contact our dental practice in San Jose and schedule a complimentary consultation. Call today! Providing quality dental care to San Jose, Los Gatos, Campbell, and Morgan Hill and all surrounding California areas.